Successful aesthetic rejuvenation of the eyelids and periorbital soft tissues requires a detailed knowledge of not only the relevant anatomy and normal aging changes, but also the advanced surgical techniques to comprehensively address the presenting deficits in order to attain natural results. Over the past few decades, a paradigm shift has occurred, in which it has become clear that facial aging is a more complex, three-dimensional process, affecting all tissue planes (skin, muscle, fat, and bone). As a result, it has become more common to see surgical and nonsurgical treatments combined for optimal results. Aging if the brow and upper eyelid occurs in all tissue planes and involves cutaneous changes, volume loss, and tissue descent. Volume restoration and neuromodulation have become an integral part of eyebrow/eyelid aesthetic rejuvenation. 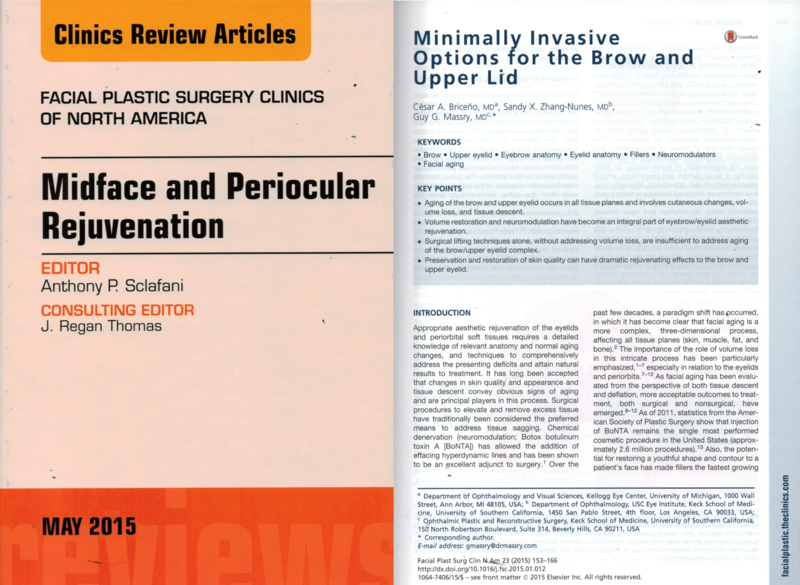 Surgical lifting techniques alone, without addressing volume loss, are insufficient to address aging of the brow/upper eyelid complex. Preservation and restoration of skin quality can have dramatic rejuvenating effects to the brow and upper eyelid. The increase in injectable treatments has been driven by reduction in procedural risk, recovery, and cost. As such, for surgeons to stay current and provide a complete array of treatment options to patients, it is incumbent to become familiar and comfortable with the varied nonsurgical interventions. Upper blepharoplasty is one of the most common facial aesthetic and functional procedures performed around the world today. It is one of the oldest described treatments of the aging face; the first recorded blepharoplasty surgery was by a Spanish surgeon, Albucasis, a pioneer in the creation of surgical instrumentation, including the use of cautery (to control bleeding) in 1000 A.D. Modern blepharoplasty has come a long way since then. Today, surgical techniques are based on preserving tissue (ie muscle and fat). This shift is founded on the concept of recreating fuller aesthetic of youth rather than the gaunt stigmata of the more traditional excision-based procedures. Contemporary blepharoplasty has undergone a paradigm shift which focuses on techniques that preserve volume. A browpexy is a minimally invasive, nonformal, temporal brow stabilization or conservative lift that can be performed in an external or internal fashion. The nasal fat pad of the upper eyelids is relatively stem cell-rich and tends to become clinically more prominent with age. This fat can be preserved and redistributed within and outside the eyelid/orbit during blepharoplasty. Lacrimal gland prolapse is a normal involutional change that can lead to temporal eyelid fullness. The gland can be safely repositioned to its native location during blepharoplasty surgery. The brow fat pad can be elevated and supported during blepharoplasty surgery to potentially improve the eyebrow-eyelid transition and contour. 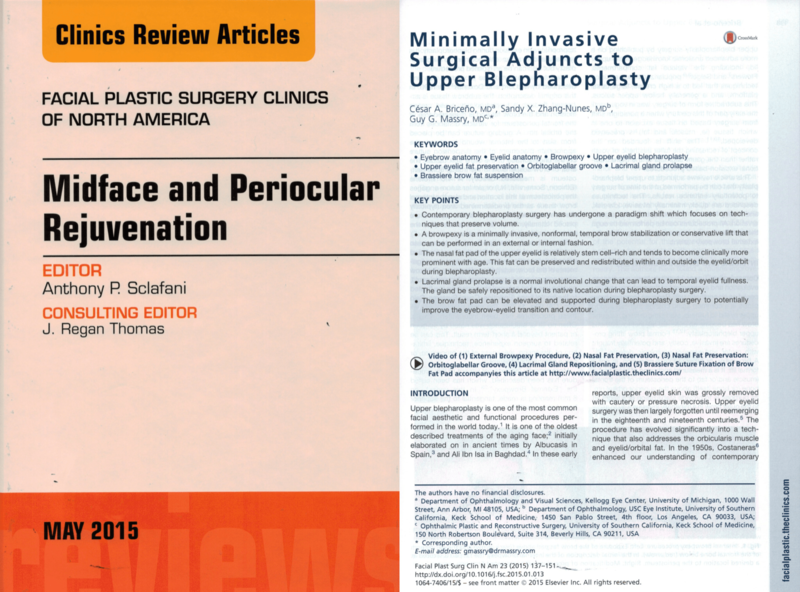 In an ongoing effort to improve results to upper blepharoplasty surgery, a variety of minimally invasive surgical adjuncts have been described. Most of these procedures emphasize volume preservation and are performed through an eyelid crease incision (with the exception of the external browpexy).